I'm sorry that I didn't manage to catch you after the concert, but thank you SO MUCH for making the trip down to Cranleigh on Friday evening and putting up the big screen. The audience really appreciated being able to see TT's dashing footwork in the Thalben-Ball Variations; it made all the difference to the evening. Yes, everybody appreciated the video presentation and the church authorities were very impressed with your professionalism. Thanks also for doing such a great job with the screen once again - as you say, people really do appreciate it and, thanks to your attachment, I've been able to see what it looks like! Thank you so much for your contribution to last night's concert; it made such a difference to be able to see the detail of Christopher's performance and I have never seen an audience so quiet. I can only assume they were mesmerised by the playing and the visuals you provided - the quality of the pictures was stunning. Friday night was very atmospheric and Christmas even before the concert started. So, the scene was set and I'm pleased to say that everyone was thrilled with both the music and the video presentation, thank you so much. I'm sure the screen really added to the event. Many many thanks for your work this evening. I had several people remark (as did the Churchwarden's wife) about being able to watch the action. 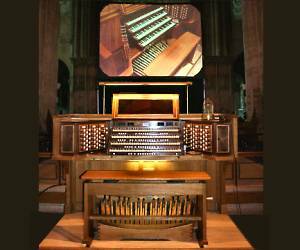 To non-organists as well as organists, it seems it's becoming more of an expectation. I hope to catch up with you in the not too distant future. Many thanks for providing the big screen both for Jeremy's recital and for Roger's on Thursday. I have often argued for us to have this facility and hopefully it will persuade the powers that be that we could have something more permanent installed. Thank you! Your expertise was very much appreciated and helped considerably in the success of the evening. Robert Gower has mentioned King of Kings. If we have the opportunity to stage a performance in the future we shall certainly ask for your professional services again. Glad you enjoyed your foray into South Derbyshire. We were very impressed with the screen and thrilled about the concert overall. We had a phenomenal turnout which surpassed our ambitions and the whole evening went very well. Very many thanks for your efforts,clearly your relationship with Carlo helped the evening run smoothly and we are very grateful to you both for making it so enjoyable. Thank you, Keith, for your efforts. I enjoyed the concert and the screens added a great deal to the experience for many. Once again many thanks for your work in Walsall and your sheer professionalism. We must fix up for you to come and do a recital here. It was great meeting you and your colleague in Salisbury Cathedral last Saturday and thank you so very much for coming with your big screen and projector to display Wayne Marshall's incredible organ playing talents to the large audience, all of whom must have gained tremendously from being able to watch him in action. Thank you so much for coming and helping to make the evening so special for everyone. Thank you once again for doing such a splendid job on Sunday. Many people commented on the improved and enhanced quality of your projection equipment - even when set against the exceedingly bright sunlight. Many thanks once again for doing such a brilliant job with the screen last night. It really made a huge difference and greatly enhanced the concert. You and your team were such good fun and I hope that you didn't mind too much having to drive so far.